So we haven't had internet service on our main computer since we've moved. We've only had it on Jay's laptop and my pictures are on our main computer. This is why I haven't blog for the last month but I'm tired of feeling like a slacker so here I am doing the best that I can. 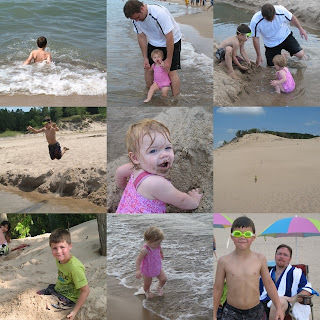 We've actually done some fun stuff and I'll start out with our trip to Warren Dunes state park in Michigan. We went near the end of August and we all had a great time. Olivia did much better then I thought she would. She loved sitting on the beach where the tide comes in, playing in the sand. Jake just loved swimming, especially under water. We all climbed the big sand dune (Jake actually ran up it) and enjoyed the view. Yay! You are back! I was wondering why you hadn't posted for so long. I look like you guys had a blast at the dunes! Maybe we will have to go there sometime when we come to visit. Cute pictures!